Recorded as from New York. Descended in the sitter's family until 1942. (Albert Duveen, New York, 1942-1948), by whom sold in 1948 to Edgar William and Bernice Chrysler Garbisch; gift to NGA, 1978. American Primitive Painting, traveling exhibition organized by the Smithsonian Inst. for the U.S. Information Service, Washington, 1954-1955, no. 5. First venue: Kunstmuseum, Lucerne, Switzerland. 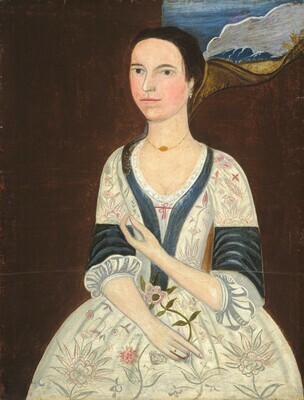 Merchants and Planters of the Upper Hudson Valley 1700-1750, Abby Aldrich Rockefeller Folk Art Center, Williamsburg; Albany Institute of History and Art; Museum of American Folk Art and New-York Historical Soc., New York, 1967, unnumbered brochure. Curran, Ona. "A Study of Portraits of Schenectady Residents, 1715-1750." M.A. thesis, State University of New York, College at Oneonta, Cooperstown Graduate Program, 1966: 51-53, 114, 140-141. American Paintings: An Illustrated Catalogue. National Gallery of Art, Washington, 1980: 299, repro. American Paintings: An Illustrated Catalogue. National Gallery of Art, Washington, 1992: 429, repro. Chotner, Deborah, with contributions by Julie Aronson, Sarah D. Cash, and Laurie Weitzenkorn. American Naive Paintings. The Collections of the National Gallery of Art Systematic Catalogue. Washington, D.C., 1992: 610-611, repro. 611.